Dr. Aimee Carrillo Rowe spoke at a Feminist Action Research in Rhetoric (FARR) event, hosted by Dr. Adela Licona's Bodies of Knowledge seminar, which is organized around looking at bodies as gendered and racialized social identities, as well as the examination of the historical formations of these identities. The literature creates moments of disruption that allow us to focus on dominant assumptions and who is given authority to create and hold knowledge. In Dr. Carrillo Rowe’s “Whose America”? The Politics of Rhetoric and Space in the Formation of U.S. Nationalism,” I was surprised and saddened by how fitting this piece was in the shadow of the recent immigration legislation SB1070 here in Arizona. Carrillo Rowe criticizes the issues raised by SB 1070 and "the state’s protection of citizens and the deeply embedded racist and imperialistic assumptions that undergird U.S. citizenship.” Carrillo Rowe's scholarship with Licona reminds us though how identity shifts across geographic space, encouraging us to be productive participants in this shift. 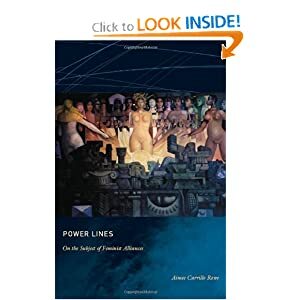 I promise to write more about Carrillo Rowe's talk from her book Power Lines: On the Subject of Feminist Alliances.